Well, the finger is still quite tender (see this post) so I haven't knit too much. However, in the spirit of Christmas I knit through the pain and finished my sister's Amanda Backpack. It came out of the wash Wednesday night and was given to her on Friday night. Barely enough time to dry! And of course I forgot to take a picture. First up is Knitting on the Edge by Nicky Epstein which was give to me by Pete. All I can say is WOW! I could spend hours looking at all these edgings. Great source for any designer or aspiring designer. Thanks Pete! My sister Kristy got me Spinning Designer Yarns by Diane Varney. What an excellent book! I have already learned so much from reading the opening pages. I learned to spin by trial and error on my own and this book explains a lot of the missing pieces. Not only does it teach you how to spin "designer" (ie bulky, slubby, etc. . .) yarns, it also covers the basics which is what I really like. Thanks Kristy! How sad, no picture for this one. Dot, my mother-in-law, got me Traditional Scandinavian Knitting by Sheila McGregor. Another great book! This one has tons of charts and lots of information (including historical info). Aren't I lucky to have such a great mother-in-law? Thanks Dot! Since I haven't been able to do a whole lot of knitting, I've been reading quite a bit too. I just finished The Virgin Suicides by Jeffrey Eugenides and The Heart is a Lonely Hunter by Carson McCullers. Both very good books which I will review on another day. I've been meaning to post pictures of my Tomtes for ages and when Wendy posted about Swedish Christmas last week, I went into action. Okay, not really. After a couple of days I talked Pete into taking pictures for me, and now 3 days after that I'm finally posting. That picture up top is our biggest Tomte and he sits on the mantle. Notice his lovely sweater! (which I did not knit.) 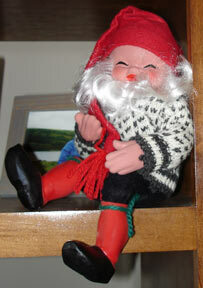 So, you're probably asking what a Tomte (or tomten) is. Well, I found a definition of Tomte here and I found more Tomte info here. But basically they are little elves that live in your house (on your farm. . . under the house. . .) and they are sometimes thought of as Santa or Santa's helpers. Oh yeah, and they are Scandinavian. Here's another. . . This guy is a little smaller and more freindly looking! than the first one. 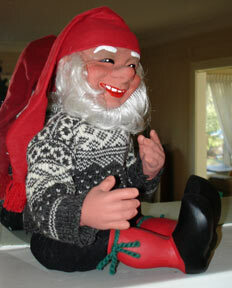 Our niece used to be scared of the Tomte in my in-laws house (he looked like the first one up there). Then there are these little wooden tomtes (here's a website that sells all kinds of them) that come in all varieties. The tall hat guy is Pete's and was given to him by a family friend years ago. And here's mine. . .
We bought this a few weeks ago when we went up to Andersonville in Chicago. While there we ate Swedish pankcakes with lingonberries at Svea and got lots of goodies from the Swedish Bakery. I must admit that I only have a touch of Norwegian in me. However, Pete is almost entirely Swedish and I have loved learning about the Swedish heritage. And if you want a cute children's book about a Tomten check out The Tomten by Astrid Lindgren it's one of Maddie's favorites! I had a fairly serious incident with an exacto knife last week while cutting photos for my patterns. It's starting to heal now, but I haven't done any knitting and probably won't be able to for at least a few more days. I did take some time to set up an online store for Black Sheep Bags though. So, if you have wanted to give one of my patterns a try but couldn't find a shop near you, you can now have them mailed directly to your mailbox! I ship them in photo mailers so that they won't get bent on the journey. And I go to the post office three times a week (because of my online rubber stamp store -- Stamping Online), so you will recieve your order quickly! Hopefully I'll have some actual knitting to show you by next week. I joined the Joliet Knitting Meetup Group. When I saw that they didn't have an organizer, of course I volunteered. I'm one of those people sho just keeps adding things to my already overfilled plate, but I really can't seem to stop myself from doing it! This should be pretty low maintenance though. Just schedule the meeting and show up basically. If you are a knitter in the Joliet, IL area, please join! I would love to see this group flourish. I've made 2 scarves and have pictures of neither, so I'm going to write about the books that I have recently finished reading. The Other Side of the Story by Marian Keyes. Okay, she is my guilty pleasure author. It's what you might call chick-lit, but I *love* her stuff. Haven't read a bad book by her yet (and I've read them all). You want some curl up by the fire with a cup of hot cocoa reading? Buy this book! I devoured it, as I have done with all of her other books. Gerat gift for yourself or a girlfriend. And finally (can you tell that I have been reading a lot lately?). . . The Curious Incident of the Dog in the Night-Time by Mark Haddon. This book was an enigma for me. At first I didn't really think it was very good, but I could *not* put it down. I literally read it in an afternoon. It's written from the perspective of a teenage boy with autism who is a savant. The strange style that the author used to create the voice of the boy is what put me off, but the story was fascinating. After a few chapters (numbered using prime instead of ordinal numbers), the voice seemed more natural to me and I got over my initial aversion to it. Check it out for an interesting read. Well, I can see that my little post hit a nerve. And that nerve is -- copyright. There is *so* much information available regarding copyright on the internet. These links are only the tip of the iceberg. If you are still confused, here's a simple rule to remember -- ASK FIRST! I just cut and pasted. This is exactly what she wrote. Can you believe it?